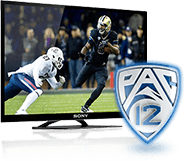 Anywhere across the United States, there are multiple options and providers for fans to access Pac-12 Networks, including a host of leading providers with Comcast Xfinity, Charter Spectrum, Cox, Dish Network and others as well as over-the-top options with Sling TV and fuboTV which can be additive options as month-to-month subscriptions. To see a list and be connected with one of the multiple options in your area, please visit GetPac12Networks.com and enter your zip code in the channel finder. In addition, we also recommend utilizing the Pac-12 Now app (for iOS and Android), which allows subscribers to access live and on-demand content from all seven Pac-12 Networks channels. For more information on the Pac-12 Now app, please visit this page on Pac-12.com. Pac-12 Networks continues to stay engaged with a variety of new and potential partners, all in service of our steadfast commitment to our fans.